The Los Angeles artist Dave Hullfish Bailey (*1963) has said “if there's a one-liner about what my [site-based projects] attempt, it has to do with replacing an iconographic vision of place with an inhabited, on-the-ground geography”. The artist's collaborative CityCat Project enables us to think this ambition via an unfolding ecology of relations between producers and audiences, histories and locations, aesthetic decisions and political effects. 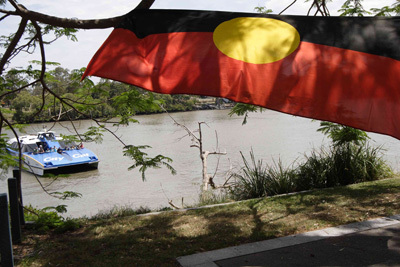 An ongoing collaboration between Bailey and the Brisbane Indigenous leader Sam Watson, the CityCat Project was initiated in 2003, when Bailey was commissioned to develop a public project for Brisbane. The artist's response led him to invite Watson, who is also an accomplished playwright and outspoken political activist, to site and choreograph unannounced interruptions to the routine routing of Brisbane’s popular CityCat ferries. Since the late 1990s these highly visible craft have played a key role in the redevelopment of the Brisbane River as a civic and touristic amenity. While the momentary diversion of the CityCat ferries constitutes its central element, the project has activated multiple forms, contexts and audiences, and includes drawings, photographic, video and sculptural works, collages, field recordings, exhibitions, architectural interventions, public discussions, slide-lectures, and publications. Characterised by this proliferation and confusion of spaces, information and agency, its radically collaborative yet authorially fragmented process assumes its participants may not share common knowledges, aesthetic languages, nor political aims. Perhaps the most significant outcome of the CityCat Project has been Watson's public declaration that the river performance is a contemporary manifestation of the Dreaming that will be told, re-told, and re-enacted indefinitely into the future. Announced in the immediate aftermath of the first iteration of the river performance in December 2006, the Mairwar Performance, as it is now known, has been re-enacted in 2009, 2012 and 2016. Rex Butler, ‘The Wind in his Sails’ in Dave Hullfish Bailey: CityCat Project 2012, David Pestorius Projects, Brisbane, 2012, n.p.